Home » Posts Tagged "NAHA/PBA 2018"
These two photos of five submitted for NAHA 2018 are by Vivienne Mackinder, HairDesignerTV.com, who was announced today by PBA as a Finalist in the Masters Hairstylist Of The Year Category. 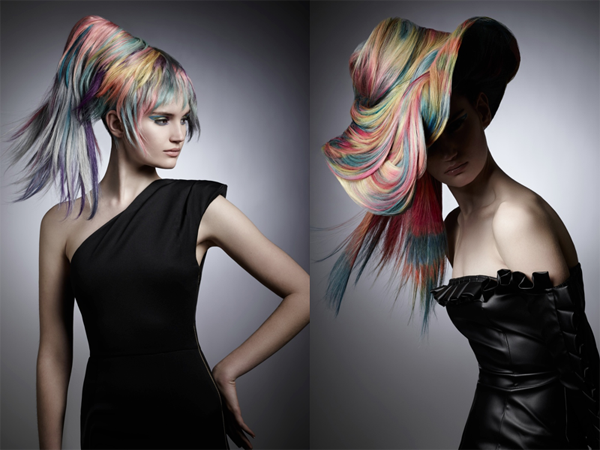 The hair was inspired by a Kaleidoscope of color and texture. “I wanted to create a fine art collection,” said Vivienne, “mixing bold shapes with movement and color, adding depth and drama.” Top talents who were winners in the Hairstylists of the Year Category and won it many times enter in this category. All the Winners from the 15 categories will be announced on July 29, at the Mandalay Bay Resort in Las Vegas. Congratulations to all Finalists. See who helped judge the Winners in the following blog. And some thoughts on judging this event open to professionals in North America.